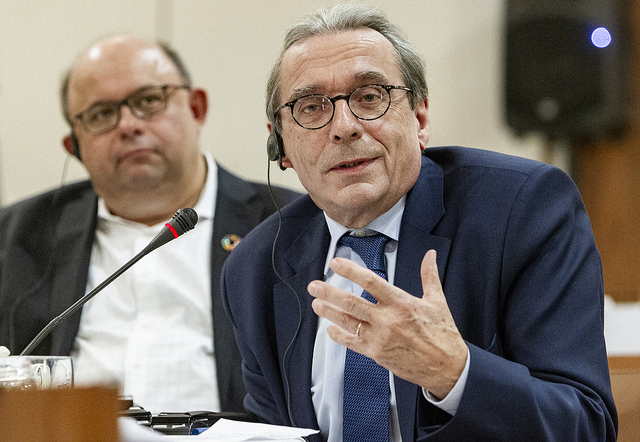 The Executive Bureau in Strasbourg agreed to set up an Advisory System for UCLG that should support UCLG facing global issues, and help the international development system understand the institutional implications of achieving genuine localization as well as help shift the role of local governments within this system. Under the name “UBUNTU”, the South African notion that sees the community as the building blocks of humanity, the Advisory Board came to life, with the aim of playing a role as intermediaries for the Presidency. Said advisory board would further provide pointed advice in various fields, as well as informal and formal support on the various dimensions of the international development agenda, and helping define the organization going into the future. The Group can also help ensure that regional specificities and nuances become integrated into the global work of the World Organization. The UCLG Annual Retreat further offered an opportunity for the UBUNTU Advisory board to gather for the first time and inspire the discourse and policies of the World Organization, by delivering the keynote speeches of the UCLG debate, which was held with both members of UCLG and members and partners of the Global Taskforce. The consolidation of the UBUNTU Advisory Board, with experts from all areas -ranging from climate action, to urban development, to gender equality- is a natural step towards the future of the organization. It is also, however, part of the evolution of the municipal movement: a movement that does not only demand to be heard, but is also willing -and able- to listen to all other stakeholders. The Debate was structured in two parts: keynote speeches delivered by the UBUNTU advisors, with an opening image meant to inspire and provoke the minds of the Floor, followed by an open floor in which members and partners exchanged among each other and with the advisors. Panellists further agreed on the importance of the debate towards shaping the discourse of the World Organization towards the international system, towards fully emphasizing the importance of localising the Sustainable Development Goals, and to no longer be an afterthought when it comes the joint implementation of the global agendas. “The 2030 Agenda is lagging behind, which makes the territorialization of the SDGs mandatory. We need to experiment at the local level to keep moving forward”. Roland Ries, Mayor of Strasbourg and Co-President of UCLG. From inspiration to concrete action. Where will we be in 20 years’ time? The UBUNTU advisors further held a closed-doors meeting with the Presidency, to transcend inspiration, and move towards concrete actions that would carry the organization to the next decade. The session kickstarted with President Parks Tau and Copresident Ada Colau highlighting the importance of networks to implement the Global Agendas, and further developed into a dialogue among the advisors and members of the UCLG Presidency. The UBUNTU advisors gave concrete proposals, during this meeting, for the development of the upcoming UCLG World Congress as well as for the organization moving forwards. 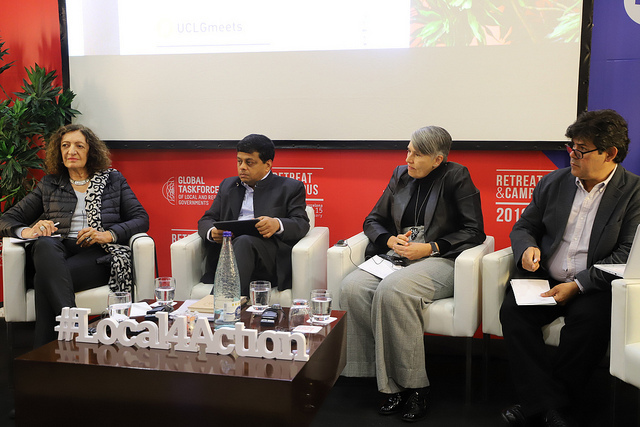 Co-Chair of Working Group II of the Intergovernmental Panel on Climate Change Debra Roberts emphasized the need for true science-based policies, arguing that the UCLG Congress ought to be oriented to reflect a focus on evidence-based policymaking. Among her key contributions stood the idea of building a UCLG network of Universities and Tertiary Institutions that would fully build on exchanges of knowledge. Ana Falú, Chair, Professor and Researcher in Architecture at the National University of Cordoba and Director of the INVIHAB, gave three concrete proposals to integrate gender equality at the heart of urban planning: mainstreaming gender policies, establishing alliances with women in the territories and, finally, including these measures in the budget. Aromar Revi, Director of the Indian Institute for Human Settlements, argued that the world in 2030 will have shifted greatly from what we currently seeing, and argued for the need to mobilize and engage with these processes in order to ensure that local and regional governments have a say in how the future shapes up. He called for the regions of UCLG to drive forward four or five key themes towards the Congress, and for the UCLG Congress to be the space in which these priorities can be developed and adopted. At the end of the sessions, participants highlighted the clear consensus in the meeting to step up to the challenge of achieving the global goals, and further called for identifying regions in which to maximize impacts, as well as to mobilize resources at the right level in the coming three months. Read more details about the Political segment: UCLG UBUNTU at UCLG Retreat 2019 here.